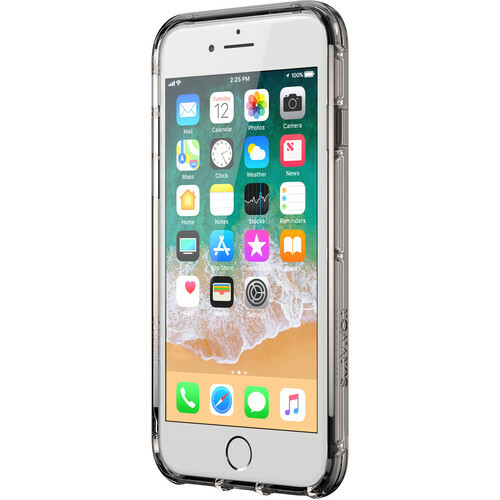 Protect your iPhone 8 without blocking its design with the black/smoke/clear Survivor Clear Case from Griffin Technology. Built from optics-grade polycarbonate, this case lets the aesthetic of your iPhone 8 shine through, without sacrificing its protection. While it features a slim design, the Survivor Clear case provides Military Standard 810-G Protection from drops up to 4' onto concrete. This case further protects your device with its built-in impact-dispersion system, which absorbs drop forces before they can damage your iPhone. With its 6H hardness rating, this case is scratch resistant as well as dirt and grease resistant. In addition, this case's impact-deflecting bumper protects your iPhone's controls, sides, and corners. Box Dimensions (LxWxH) 7.55 x 4.5 x 1.4"